Indian School Sohar participated in STAI 2018 (Science Technology and Innovation) organized by Indian School Muscat on 24.01.19 under the aegis of the Board of Directors of Indian schools in the Sultanate of Oman with the collaboration of all Indian Schools in the Sultanate. The mega inter- school learning exchange, STAI-2018 aims to provide platform and showcase the immense scientific talents of young minds. Around 650 students from 14 Indian schools took part in this mega event. Inventors: Anish C S-XII A, Vaansh Lakhwara-XII B, Pooja Rajamohan - XI B, Raunak Singh-XII B, Aaryan Dwivedi-XII A, Antala Deep-XII A, Harsh Patel- XII A, Anurag Bandhopadhyay -XII A.
Mr. S. Xavier, the faculty member from the chemistry department got prize for his Paper Presentation on the topic ‘Attitude for science among secondary and senior secondary students’. Seven students of our school, Dhruvi Joshi-VI A, Harit Mehta-VII F, Kushal M- VIII B, Khanjan Choksi-VIII B, Aaron Mathew- VIII C, Sambhavi Adhikari- VIII F and Anikesh Pawar-VIII F are among 2% top achievers of Aptitude test conducted on 13.11.18. The prizes were received by the winners from the Chief Guest, H.E. Munu Mahawar, Ambassador of India to Sultanate of Oman, during valedictory ceremony held on 24th January 2019 in ISM. It was an enriching learning experience for all the students and teachers who participated in the mega-event. 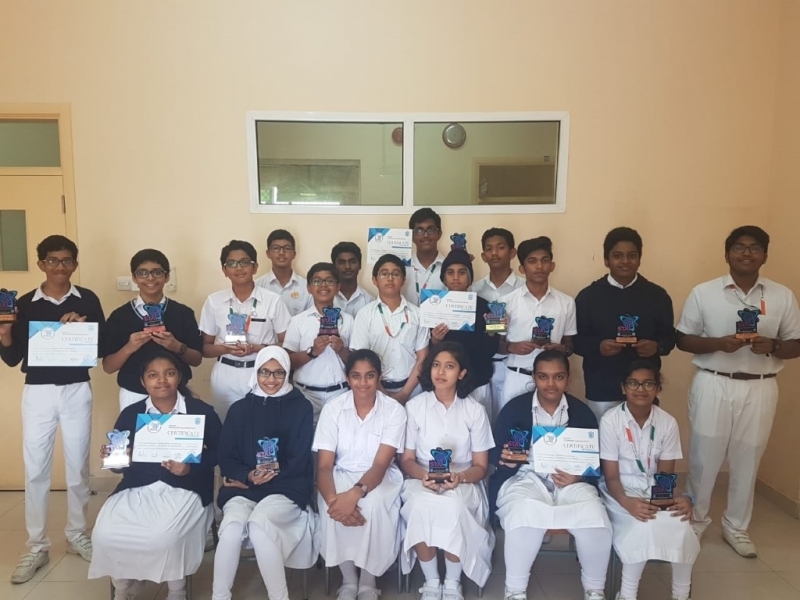 All the students were thrilled with the outcome of their performance by winning bag full of prizes and bringing laurel to Indian School Sohar. Ms. Ajita Nair, was the STAI coordinator from our school.